Click here for electric meat grinders. 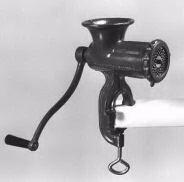 Manual meat grinders have been used since the early 1800's when a German revolutionist, Karl Friedrich Christian Ludwig Freiherr Drais von Sauerbronn, also known as Karl Drais invented it. Manual meat grinders are an economical way to make homemade sausage. They are available in tin, epoxy coated cast iron or stainless steel. You would be surprised at how well the new manual meat grinders work! They are a handy addition to any kitchen. Actually, we think a meat grinder is a must-have to make the modern kitchen complete. What type of Manual Meat Grinder are you looking for? This is a smaller size grinder but great for around the kitchen. It is made of cast iron with an epoxy coating and includes one hamburger plate. American made! 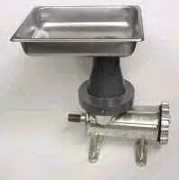 This meat grinder is great for smaller batches of meat when you don't want to pull your electric meat grinder out. Great for around the kitchen. Made from aluminum alloy and comes with one hamburger plate and one knife. 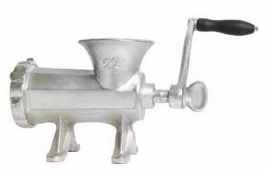 This is a Weston meat grinder. Great for grinding your own meat to make the best hamburger patty that made to your own specifications. It includes a 3/16" grinder plate. 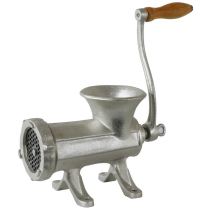 This meat grinder it very high quality and it includes a 3/16" and 3/8" grinder plate plus sausage stuffing tubes. 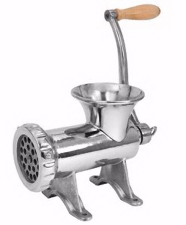 This meat grinder is the same size as #10 above except it is able to be bolted down. Very sturdy!! This meat grinder is ready to make some homemade sausage and is also American made!!! Includes a 3/16" hamburger plate and knife. Process your own sausage, bratwurst and hamburgers with ease using this Cast Iron Meat Grinder. Blend meat with your favorite seasonings for fresh and healthy homemade meals. Use your own casing for homemade sausage, pepperoni and bratwurst. Add your own spices and seasonings to make each recipe just the way you like it. You can even grind vegetables to prepare great tasting meals. Hand grind up to 4 pounds of your choice of meat per minute. The cast iron body is durable and easy to clean. This Grinder can be bolted to a table or counter top for stability. Includes 1 cutting knife, 2 cutting plates (1 Fine 1/4 in. and 1 Course 1/2 in. ), 3 sausage tubes. Made in America! Comes with a 3/16 hamburger plate. Rugged stainless steel construction. Durable crank handle design; uses a nylon bushing to ensure smooth operation. This #22 grinder comes with a pulley and handle for manual grinding but can be attached to a motor for electrical operation. New design allows removal of the auger without removing the pulley! Must be used with a meat pusher!! This grinder CAN CAUSE AMPUTATION!!! Meat pusher is available below. Durable crank handle design uses a nylon bushing to ensure smooth operation. Secures to your table or countertop. Includes Fine & Coarse Grinding Plates, Precision steel grinding knife, stuffing star, a set of 3 stuffing funnels 14 mm, 19mm, 24mm & flange. This grinder is similar to the #22 above but BIGGER! Comes with a pulley and handle for manual grinding but can be attached to a motor for electrical operation. New design allows removal of the auger without removing the pulley! Comes with a 4mm grinder plate and grinder knife. Important safety feature for motorized grinders. If you intend to motorize your grinder, you should put this extension onto your grinder. The picture shows the extension mounted on a #22 grinder. It also shows the #699783 pan mounted on the extension which can be purchased separately. Replacement grinder pan. Holds extra meat in preparation for grinding. This pan fits the aluminum safety extension cones for the #12, 22, & 32 grinders. 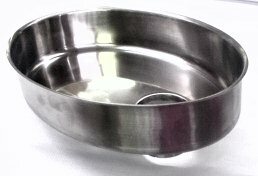 This pan has a 2.5" throat. Measures 8 3/4" W x 13" L x 2 1/2" D.
One of the Old, old favorites. Better for chopping cooked foods or fresh vegetables than it is for grinding meat. It includes fine, medium and coarse blades that are cast iron with tin plating. Also one of the Old, old favorites. Better for chopping cooked foods or fresh vegetables than it is for grinding meat. 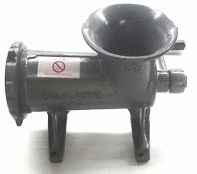 It includes fine, medium and coarse blades that are cast iron with tin plating. Pushes meat through grinder with your fingers safely out of the way. Measures 12.5" long and 6" deep & 1 5/8" in diameter.